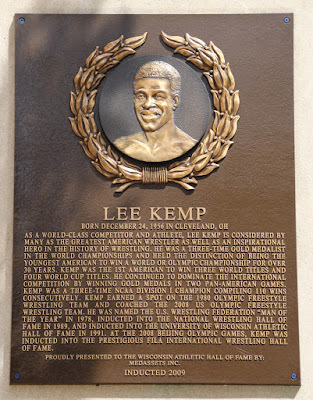 As a world-class competitor and athlete, Lee Kemp is considered by many as the greatest American wrestler as well as an inspirational hero in the history of wrestling. He was a three-time gold medalist in the world championships and held the distinction of being the youngest American to win a world or Olympic championship for over 30 years. Kemp was the 1st American to win three world titles and four world cup titles. He continued to dominate the international competition by winning gold medals in two Pan-American games. Kemp was a three-time NCAA Division I Champion compiling 110 wins consecutively. Kemp earned a spot on the 1980 Olympic freestyle wresting team. He was named the U.S. Wrestling Federation "Man of the Year" in 1978, inducted into the National Wrestling Hall of Fame in 1989, and inducted into the University of Wisconsin Athletic Hall of Fame in 1991. At the 2008 Beijing Olympic Games, Kemp was inducted into the prestigious FILA International Wrestling Hall of Fame.